Fulham manager Roy Hodgson has been named the Premier League's manager of the month for October. 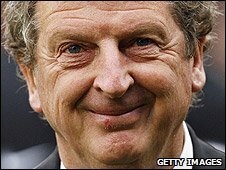 Hodgson's side went through the month unbeaten, recording three wins and two draws in two competitions. The Londoners beat Liverpool and Hull in the Premier League, and they got the better of Basle in the Europa League. Hodgson, 62, also steered his side to impressive draws away to Manchester City and West Ham as well as at home to Italian giants Roma.